July 30, 1997 – My wife and I were both 40 years of age and well aware of the risks associated with having our first child at this late stage, so we were both a little anxious going in for the first ultrasound. Our anxiety was relieved somewhat when we saw for the first time our baby moving and kicking. The technician pointed out various organs and did her best to explain what we were seeing. At one point we got a very clear image of the baby with its thumb in the air, as if it was giving us a thumbs up signal. When the technician left the room, we were feeling pretty good, but we still hadn’t heard what we had come to hear—that everything looked fine. Then a doctor came in to do a final scan. We could both sense that something was different this time around. The doctor concentrated on one particular area when he did the ultrasound. A few minutes later he explained to us what he was looking at. He told us that our fetus had a condition known as CDH (congenital diaphragmatic hernia). He explained how the stomach had pushed through the diaphragm on the left side and into the chest cavity, moving the heart from the left side to the right. He told us that it was a rare condition and that it was life threatening to the fetus. He also said that the condition had a twenty to thirty percent mortality rate. My wife immediately agreed to have amniocentesis performed to check for any chromosome abnormalities. The doctor gave us the number of a pediatric surgeon to talk to. We were obviously devastated by the news. We went on the Internet as soon as we got home. We found a lot of helpful information, but a lot of what we found was conflicting and out of date. Q. What kind of quality of life would the baby have if we have the operation? Complications? Lung diseases? Physical limitations? A. If the baby has enough lung tissue, we could expect to have a healthy baby with proper management. The lungs continue to develop up to ten years of age. Lung disease would be rare. Physical limitations could be overcome. Q. What about feeding tubes? What other special care needs could we expect? A. 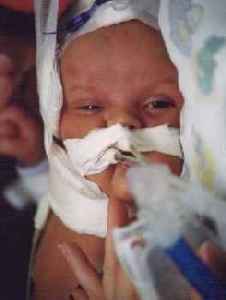 A feeding tube for the first year is a definite possibility. The child may also need oxygen for the first few months back home. There shouldn’t be any other special care needs. Q. What other organs might be compromised? A. Primarily the lungs only. Q. What percentage of parents in a similar position to ours choose to terminate the pregnancy? A. The minority choose to terminate. Q. What is the best case scenario? What is the worst case scenario? What is the most probable scenario based on what we know now? A. Best case is the operation will be successful and we will have a healthy baby with no complications. Worst case is the baby will not have enough lung tissue and will die shortly after birth. The most probable scenario is that the condition will require management for the first few years of life. Q. What is the recommendation in the case of a chromosome abnormality? In addition to the above, we also asked about having the operation in-utero. We were informed that the best chance was to wait until after birth. He gave us 50/50 odds with the in-utero operation and 70/30 odds if we waited. We both felt more positive about the situation after talking to the pediatric surgeon. Q. Is there any danger to Lynn (the mother)? August 13, 1997 – We called the lab to get the results of the chromosome test. All of the tests were normal. We both felt better knowing that we would be taking the baby to term. We also learned the baby was a girl. 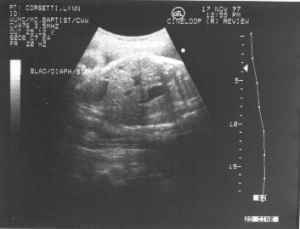 October 31, 1997 – Lynn had her fourth ultrasound. Her doctors wanted her to get an ultrasound every month to check the baby’s growth and to rule out hydropic changes. This particular ultrasound indicated that Lynn had some excess amniotic fluid. 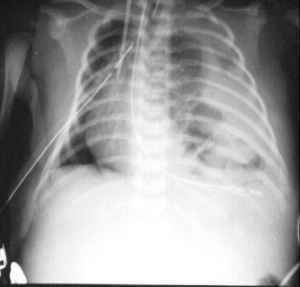 The excess fluid was a result of the hernia and the baby’s inability to regulate the fluid through her body. During this visit we toured the neo-natal unit at Children’s Hospital in St. Louis, MO. We decided on Allison Michelle for the baby’s name. 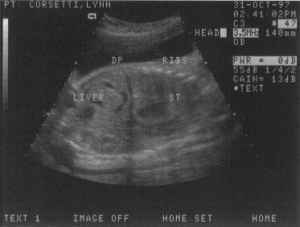 November 17, 1997 – Lynn had her fifth ultrasound. She still had excess amniotic fluid, and the doctor requested that she have another ultrasound in a week to monitor the increase. November 18, 1997 – On a routine doctor visit Lynn was found to have elevated blood pressure. Her doctor recommended that she go to the hospital for further checks. She was hooked up to several monitors that monitored both the baby’s heartbeat and contractions. Lynn was experiencing sporadic contractions. She was given a muscle relaxant used in the prevention of premature labor. The doctor recommended that Lynn stop working and get bed rest for the remainder of the pregnancy. January 6, 1998 – Lynn was full term. Lynn’s doctor had planned on inducing labor a week earlier, but due to scheduling conflicts, the holidays, and an unfavorable cervix, her doctor decided to wait until January 6. On January 6 Lynn was admitted to the hospital to begin the induction process; the cervix was still unfavorable at this time. Low dose Pitocin was started early on the seventh and was increased throughout the day. By six p.m. Lynn’s cervix had opened only 1.5 centimeters. The Pitocin was reduced overnight so she could eat and get some rest. Early on the eighth the Pitocin drip was increased again. Lynn’s induced contractions were two to three minutes apart and painful. She requested and received pain medication. She got an Epidural around five p.m. at four centimeters. Lynn received a continuos Epidural up to delivery which occurred at 8:23 p.m. on January 8. January 8, 1998 –Allison was born at Barnes Jewish Hospital in St. Louis, Missouri. This hospital was chosen because of its close proximity to Children’s Hospital where the NICU (Neonatal Intensive Care Unit) is located and where Allison was to be taken immediately after birth. A team of doctors and nurses were on hand to assist with the delivery and transporting of Allison from Barnes to Children’s. Lynn delivered in an operating room instead of the normal birthing room in order to accommodate the extra people. The early signs immediately after birth were somewhat positive. A slow heart rate was improved with a few chest compressions. A tube was placed down Allison’s trachea, and a doctor breathed for her using a hand held air bag. Her color was good. One of the surgeons said she could hear breaths in both lungs with a stethoscope. When Allison was stable enough for transporting, they wheeled her from the operating room through a maze of hallways to the adjacent Children’s Hospital NICU. I followed her to Children’s and was told to sit in the waiting room while they attempted to put Allison on a respirator. By 10:30 p.m. Allison’s condition had worsened. Her oxygen saturation levels were not where they should have been. Her upper sats were okay but the lower sats were not. A chest x-ray showed that Allison had suffered a pneumothorax of the right lung (a collapsed lung). I was told that the doctors were considering putting Allison immediately on ECMO (a heart/lung bypass machine).We asked that a Chaplain be called. Allison was baptized while on an oscillator. 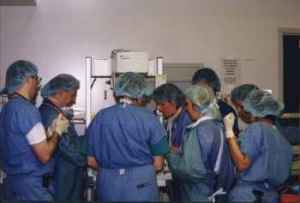 January 9, 1998 – Shortly after midnight on January 9 the decision was made to put Allison on ECMO. At 3 a.m. we received word that Allison was on ECMO and her condition was stable. We were told by the pediatric surgeon that he was not overly optimistic about Allison’s chances due to her poor saturation levels and the difficulties they had encountered shortly after birth. He told us that we could expect for Allison to remain on ECMO for two to three weeks. After a sleepless night, I wheeled Lynn over to the PICU (Pediatric Intensive Care Unit) to see Allison. We were both excited to see Allison, but we knew that her situation was critical. We were told before hand that ECMO was used only as a last resort. Having family members close by helped out immensely. The nursing staff was also helpful. They answered question after question without complaint. They also bent some rules by allowing us to have more than just two people in to see Allison. We were told that Allison would have two nurses twenty four hours a day as long as staffing levels permitted it. We had toured the NICU and PICU prior to Lynn giving birth, so we had a pretty good idea of what to ex pect. But there weren’t any children on ECMO when we took our tour. We were both shocked when we first walked in. Allison was placed in a private room in order to accommodate all the equipment. Lynn and I would eventually spend a lot of time in this room. It would become our home away from home. When we first saw Allison her eyes weren’t open, which wasn’t all that surprising considering what she had just been through, not to mention the fact that she was heavily sedated. The doctors and nurses warned us that Allsion would have some fluid build up and that she would eventually look much more bloated. She looked fine to us. We stared a lot. We also took a lot of pictures. I ran for my camera for this one when I saw her her with her eyes open. That first day we only spent a few hours with Allison. Lynn and I were both exhausted and Allison was doing fine. We had made it past the first hurdle. All we could do now was wait. 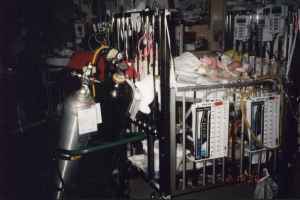 January 10, 1998 – Allison remained stable on ECMO. She had some fluid build-up and appeared puffy in the face and extremities. The pediatric surgeon informed us that he would not attempt corrective surgery while Allison was on ECMO due to the high risks of bleeding and other possible complications. His plan was to keep Allison on ECMO for a full two to three weeks. At that time he would try to wean her off of the machine. He told us that if she didn’t show that she had enough lung tissue to support herself, then there would not be an operation. For the next two weeks we waited for improvement in Allison’s condition. 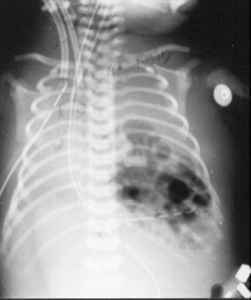 The indicator of improvement was her chest x-rays. The x-ray to the right was taken the day after Allison was placed on ECMO. We were told that Allison’s lungs were filled with fluid and that was why the image was whited out. As the fluid was slowly replaced by air, the lungs would eventually appear darker. Allison had a chest x-ray taken once a day. We were told to not expect any changes right away. From the outside Allison appeared like a normal, healthy baby, except for her stomach area which was smaller than normal. This was due to the fact that her stomach and all of her bowels had been shifted into the chest cavity. The surgeon assured me that there would be plenty of room for the bowel and stomach if and when he performed the surgery. The surgeon was still somewhat pessimistic about her chances and was careful to not give us any false hope. I returned to work eight days after Allison was born. Fortunately, my schedule permitted me to visit with her every day. Lynn spent most of every day with Allison. One of the first things we did was decorate her room with stuffed animals and toys. The nurses recommended that we buy Beanie Baby toys. The Beanie Babies didn’t take up a lot of room, and they were useful for supporting and redirecting various IVs and wires. By now Allison was pretty well known in the family, and we had letters and pictures from her cousins which we also taped on her bed. We played lullaby tapes for her and read to her. We couldn’t pick her up and hold her, but we spent a lot of time holding onto her hand and just touching her. We also got to put lotion on her to prevent her skin from becoming too dry. The nurses surprised us one day by dressing Allison in a T-shirt we had bought for her. It was the first time we had seen her in anything but a diaper. She never looked cuter. After about a week and a half Allison started to build up a tolerance to the sedation drugs she was getting. We had to be careful to not talk to her on the side with the canulaes, otherwise she might try to turn her head to see who was talking. This was a fun time for us. We got to see some of her personality. She responded to our voices. We could tell that she was as anxious as we were for things to move forward. The nurses cautioned us, however, that how well Allison did on ECMO was no indication of how well she might do off of ECMO. It was the machines, they reminded us, that were keeping Allison alive. We knew that Allison couldn’t remain on ECMO forever and that she would eventually have to prove herself. 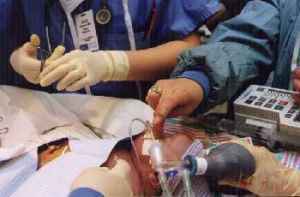 The longest any child had ever been on ECMO and survived, at least at Children’s hospital, was 28 days. Allison was pushing two weeks. The x-ray on the right was taken a few days before they attempted to take Allison off of ECMO. This x-ray clearly shows the defect. The dark area in the left chest cavity is air in her bowels. January 24, 1998 – The weaning process began. Every hour the machine was adjusted so Allison’s heart and lungs did more of the work. Early Sunday morning on the 25th the weaning process was halted due to low saturation levels and a drop in blood pressure. This was extremely disappointing because it was a possible indication that Allison might have difficulty coming off of ECMO. We learned later that the night nurses had overreacted and should have continued to wean. The communication problem was ironed out and the weaning process was started again on Sunday afternoon. To avoid further problems, they decided to suspend the weaning process at midnight and resume at six the next morning. This way if Allison were to run into problems it would be in the afternoon when they would be better staffed to handle the situation. The 25th was Super Bowl Sunday. I ended up watching most of the game on the little TV in Allison’s room. Lynn and I went home that night knowing that the next day might be the last time we might ever get to see Allison. 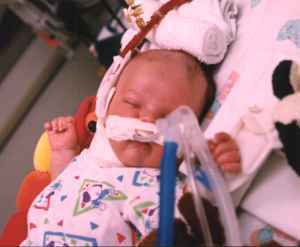 January 26, 1998 – After some very tense hours Allison was successfully taken off of ECMO. Her ventilator support, however, was high — 30 over 5. The high ventilator support was a possible indication that there was insufficient lung tissue; there was also concern that Allison might have had another pneumothorax. 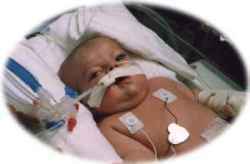 Allison was moved down to the fifth floor NICU. 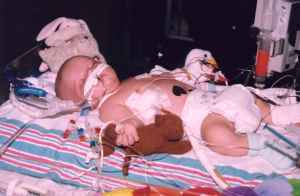 Later that evening Allison’s blood gasses improved and they were able to reduce the ventilator support. Allison’s pediatric surgeon informed us that Allison was doing better than expected. He told us that if she continued to do well he would operate either at the end of the week or early the next week. It was the first positive news that we had heard since Allison’s birth. Getting off of ECMO was a huge step. It meant that Allison had a good chance of having enough lung tissue in which to survive. Lynn and I were cautiously optimistic. We knew that Allison still had some big hurdles to overcome. January 28, 1998 – Allison continued to show signs of improvement. The chest x-rays were favorable, her blood gasses were good, and she was way down on her ventilator support. The pediatric surgeon decided to operate on Allison to repair the hernia. The operation was completed around 2:15 p.m. We were told that the hernia was repaired with a patch. He told us that the left lung was larger than expected and that it took up about a third of the chest cavity. He mentioned that about a third of the liver had also passed through the hole in the diaphragm. He told us that things went well and that it was now up to Allison to show us what she could do. For the first time since learning of the defect I felt positive about Allison’s chances. We were told that the week following the operation would be the most critical. February 7, 1998 – It had now been more than a week since surgery. Allison’s initial response after surgery had been positive. The surgeons were optimistic. They decided to try to wean her from her support. The ventilator has four important settings: oxygen level, peep and pap, and the rate. The oxygen level is the percentage of oxygen flowing through the ventilator. The peep is an indicator of the constant pressure provided by the ventilator. The pap indicates the highest pressure provided by the ventilator. And finally, the rate is how frequently the ventilator gives Allison her breaths. The weaning process involves reducing one or more of these settings from the level needed to get good blood gasses. Unfortunately, every time they reached a certain point in the weaning process Allison’s numbers would fall, and they would have to set everything back to where they had started. They told us that her problem was severe pulmonary hypertension. They explained to us that the blood vessels in her lungs were constricted, reducing the amount of blood flowing through the lungs and subsequently affecting her oxygenation. In Allison’s case, the pulmonary hypertension was so bad that the only time she did well was when she was asleep or not moving. She did poorly when she was awake or when she was being handled. Running out of options, the doctors decided to switch Allison to a different ventilator which would allow the addition of Nitric Oxide gas. Nitric Oxide is a pulmonary vascular dilator that works only on the lungs. It was hoped that the Nitric Oxide would help dilate the blood vessels in her lungs and allow better blood flow. The silver tank shown on the right was the Nitric Oxide tank. Allison responded very well to the Nitric Oxide. All of her numbers improved: blood pressure, heart rate, pH, and oxygenation. In addition to the Nitric Oxide, they made some other changes including reinserting a larger tube down her. Lynn and I were elated. Allison looked great. She was alert, moving around, and she followed us with her pretty eyes. I read to her every book that she had, pointing out the pictures as I went along. We did everything but give her a going home party. We were certain that the Nitric Oxide had helped her turn the corner. 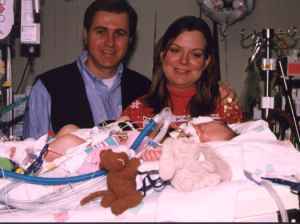 February 9, 1998 – While weaning Allison from her support, her heart rate dropped and her oxygenation deteriorated. Allison suffered another pneumothorax in the right lung when they tried to bag her. They inserted another chest tube to clear the air from around the lung. This fixed the pneumothorax, but her numbers were still poor. They decide to put her back on a paralytic drug. Her numbers continued to waver over the next few days. Not all the signs were negative, however. The x-ray shown below was taken during this period. You can see that the right lung is fully inflated and that it took up most of the chest cavity. The gray area in the right center of the right chest cavity is her heart, which was still deviated slightly to the right. You can also see the inflated left lung. It took up close to forty percent of the chest cavity. This x-ray looked very promising to me. The Doctor’s, however, pointed out that it wasn’t the amount of lung tissue that mattered–it was the quality, or the ability of the lungs to oxygenate blood. Allison was still having problems with the quality issue. February 12, 1998 – The decision was made to keep Allison on high support without making any changes in hope that she would remain stable for at least a 24 to 48 hour period. Her ventilator was set at 32 over 5. She was put on 100% oxygen and 40% Nitric Oxide. Allison responded to the high level of support with better numbers, but she was also heavily sedated and on the paralytic drug. February 16, 1998 — Allison suffered another setback. 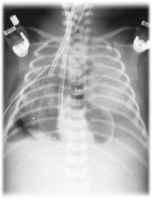 She developed a pneumothorax in the left lung. We were told that her saturation levels hadn’t changed much during the pneumothorax. While this was promising news about the right lung’s capacity, it was also an indication that the left lung wasn’t contributing very much to the overall output. The left lung’s pneumothorax did not resolve itself immediately after the chest tube was put into place and continued to leak air. 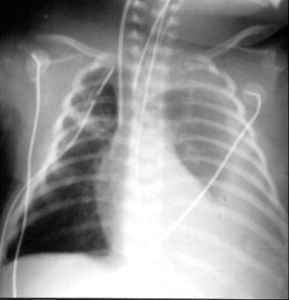 February 20, 1998 – Allison developed pneumothoracies in both lungs. Despite the leakage of air in both lungs her saturation levels were in the upper nineties. The doctors decided to take her off the paralytic drug in hopes that she would lose some fluid and also to see how well she would respond. February 21, 1998 – Allison did not respond well to the removal of the paralytic drug. When I arrived at the hospital in the afternoon, I learned that she was running a fever. Her color was pale, almost blue. Her heart rate was well over 200 (her normal heart rate had been around 140). She didn’t look good at all to me. Later that night Allison started to spiral downward. All of her numbers were poor, especially her pH. Allison went into cardiac arrest and had to be recessitated with chest compressions. Her blood pressure dropped to zero for several minutes. Amazingly, she rebounded quickly and her numbers once again looked good. The doctors decided to put her back on the paralytic drug. My wife and I were concerned about her condition and decided to spend the night at the hospital. February 22, 1998 – At seven in the morning my wife and I learned that Allison had had another episode of heart arrhythmia, or irregular heartbeat. When we got to her bedside, we found that her heartbeat was about 130 and dropping slowly. We also learned that she hadn’t had any urine output since three in the morning. This was an indication of possible kidney damage. At 8:30 a.m. the resident asked to meet with my wife and I privately. We were both exhausted, stressed, and extremely worried about Allison’s condition. Our concerns were confirmed when we were told that Allison would not survive. They told us that the right side of her heart was enlarged and would eventually fail. It was a direct result of the prolonged pulmonary hypertension. Faced with the inevitable, we decided to stop further intervention. Allison died in Lynn’s arms shortly after 9:00 a.m. It was the first time either one of us had held her. When I started this case study, I was confident that it would end on a happy note. Lynn and I never lost hope. I decided to complete the case study in the hopes that others might benefit from our experience. If you are reading this because you have a child with CDH, please don’t give up. As I said at the beginning, technology is changing at a rapid pace. Be your child’s advocate. Learn as much as you can and don’t be afraid to ask questions. A good source for information on CDH is the CHERUBS Web site. Although you were here but for a brief stay, you’ve touched our hearts in many ways. You’ve taught us about hope and faith and the power of love; and you’ve showed us how fragile life can be. You’ve brought smiles to our faces and tears to our eyes; and you’ve brought people together; first in celebration, then in prayer, and finally in sorrow. Most amazing of all, you’ve accomplished this and more without ever having uttered a single sound, without ever having seen a sunrise or a sunset, without ever having taken a breath on your own. From the doctors and nurses who took care of you, to those of us who got to know you, to those who knew you only in name, you’ve had an impact on us all. We miss you sweetheart. You will live on in our hearts and minds forever. We will be together again some day. If in the future we are asked if we have children, we will tell them yes—her name is Allison and she is an Angel.